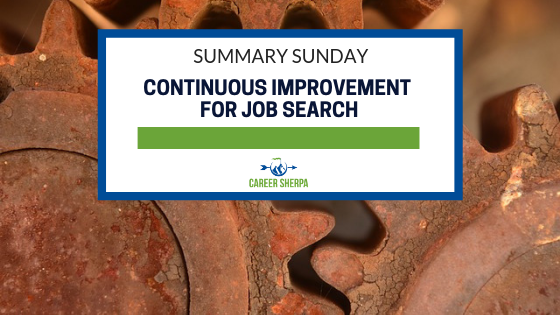 Have you adopted a mindset of continuous improvement for your job search? If your job search skills are a bit rusty and you aren’t getting results, then it’s time to add some new tricks! The methods and processes companies use to source and recruit candidates to fill jobs changes over time. Your job search strategies need to adjust too! This week’s summary featuring advice to help you embrace networking, especially if you are an introvert, how to interview better and enhance your LinkedIn profile. Plus you’ll find a list of top recruiting firms and assessments to help you find the perfect career! Follow some or all of these suggestions for what you can do to set yourself apart from the millions of people on LinkedIn! This article/interview features Karen Wickre, author of Taking the Work Out of Networking, and one of the most connected veterans of Silicon Valley. She provides 3 no-pressure networking strategies and tons of advice on how to comfortably network! This is a list of the top 200 executive search firms specialized in filling positions with salaries of at least $100,000. You can sort by state. Keep in mind, some recruiting firms specialize in industry or role. Always check the listings on the firm’s website to see what types of jobs they are recruiting for. And most importantly, remember that recruiting firms work on behalf of the company… not you. They will be interested in you only if you have the skills/expertise that matches the jobs they are trying to fill. Is This the Reason You Keep Getting Interviews That Don’t Turn Into Offers? Stop making this mistake during your job interviews! By following these tips, you’ll win over the interviewer, not just answer their questions. It’s surprising how much damaging information is out on the internet about people. What’s even more surprising is that you aren’t checking or doing anything about it. Implement these three things and you’ll change the way you approach your next job interview. People often want to make a career change but don’t know what career they should move into. Use one (or more) of these assessments to find your dream career. I know you are busy doing your job…but these applying these 4 habits will make you smarter and more marketable! My newest article provides tips on how to ask for an increase in salary. 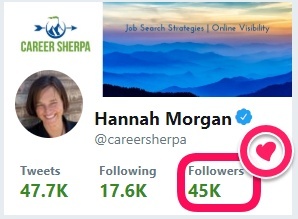 I hit a Twitter milestone this week! And I earned every single one of these followers organically. I never paid for followers. I just tweet great stuff about job search, careers and workforce trends!